Youtiao, literally means ‘oil stick’, is a long golden-brown deep-fried strip of dough, it’s twisted like a cruller and so made that you can tear it lengthwise in two halves. Youtiao are eaten at breakfast, as an accompaniment for rice congee, soy milk, or stuffed inside a roasted flatbread to make a sandwich. We really missed this for breakfast in the first year in UK, youtiao was one of the reason for homesick. One day we found Yorkshire Pudding, which is mainly flour-based and fried, with its similar texture and its golden colour, but it seems totally different kind of food judged by its round cup shape. 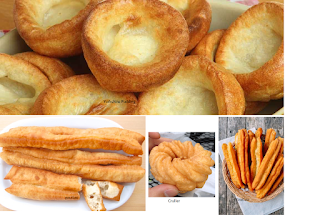 Oven baked for four minutes till it’s crispy, when dipped into soy source, Yorkshire Pudding tastes exactly same as Youtiao, and perfect with rice congee, and soy milk too!